Endometriosis, a relatively common condition, rarely involves the bowel; even more rarely does it present as a large-bowel stricture with intestinal obstruction. We report the case of a young woman who presented to an emergency department with intestinal obstruction secondary to an endometriotic stricture of the sigmoid colon, without evidence of disease elsewhere in the peritoneal cavity. Although large-bowel obstruction is usually caused by a malignant tumour, it can sometimes result from rare causes such as endometriosis. Symptoms of a cyclical nature may remind the clinician of this possibility. Endometriosis, first described by von Rokitansky in 1860, is an oestrogen-dependent inflammatory disease characterised by the presence of functional endometrial tissue outside the uterus. [1,2] This benign but painful condition affects up to 15% of women of childbearing age, and nearly half of all infertile women, and 70% of women with chronic pelvic pain have endometriosis. [1,2] Together with dyspareunia, the above symptoms form the 'classic triad' of the disease. The GIT is involved in 3 - 37% of women with endometriosis, and although it can affect any site, the rectosigmoid colon (72%), small intestine (7%), caecum (3.6%) and appendix (3%) are most commonly involved. [1-5] Usually the disease takes the form of small asymptomatic serosal implants, but these can progress and become symptomatic. The symptoms are usually chronic and cyclical;[1-6] acute presentations such as intestinal obstruction, appendicitis, appendicular intussusception, rectal bleeding and bowel perforation are relatively uncommon. We report the case of a young woman who presented with intestinal obstruction due to rectal stricture secondary to endometriosis. A search of available English language literature revealed that large-bowel obstruction due to colonic endometriosis is rare. A 23-year-old woman presented to our emergency department with abdominal pain, nausea, vomiting and abdominal distension of 1 week's duration. She had been having similar symptoms repeatedly over the past 6 months, and her local doctor had diagnosed intestinal tuberculosis and started her on antituberculosis therapy. On examination, she was dehydrated and sick-looking, with tachycardia, tachypnoea and palpable bowel loops. Abdominal radiographs revealed dilated ileal and large-bowel loops. In view of her condition, a provisional diagnosis of recurrent small-bowel obstruction (possibly secondary to tuberculosis) with the possibility of strangulation or perforation was made, and she was taken to the operating theatre after she had been adequately resuscitated. Laparotomy revealed adhesions of the ileum in the pelvis, which were easily mobilised. On following the bowel, the sigmoid colon was found to be densely adherent to the left ovary and the left iliac vessels, all forming a jumbled-up mass that could not be separated safely. This was the point of bowel obstruction, and there appeared to be no way of mobilising or resecting it safely. A decision to perform a relook operation after further investigations was made, and a loop ileostomy was performed in the right lower abdomen. Postoperatively the patient underwent colonoscopy, which revealed a tight, non-negotiable stricture in the sigmoid colon. Multiple biopsies revealed nothing of note, and carcino-embryonic antigen levels were within normal limits. After discussing the situation with the patient and her family, it was decided to re-operate 4 - 6 weeks later. A computed tomography scan after 6 weeks revealed a circumferential growth in the sigmoid colon, with obliteration of the lumen. There was no other abnormal finding. At surgery a tight stricture was seen in the sigmoid colon, with minimal adhesions. The ovaries were enlarged, but there was no other significant intra-abdominal finding. 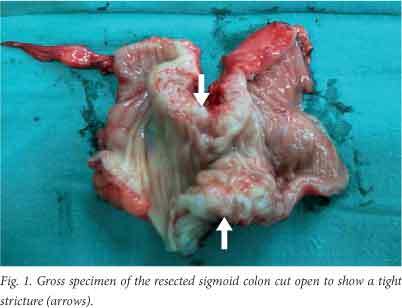 A sigmoid colectomy was performed, with primary colorectal anastomosis in a single layer. The postoperative course was uneventful, and the ileostomy was taken down and bowel continuity restored 3 weeks later. Histopathological examination of the resected specimen (Fig. 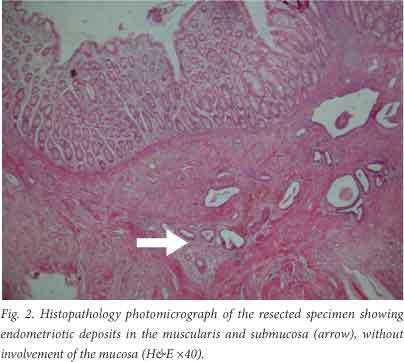 1) revealed endometriotic deposits in the muscularis and submucosa, without involvement of the mucosa (Fig. 2). A range of theories have been put forward to explain the pathogenesis of endometriosis, but none has yet been fully accepted. The most widely accepted is Sampson's theory of retrograde menstruation, according to which endometrial tissue refluxes through the fallopian tubes during menstruation and implants on the serosal surface of abdominal and pelvic organs. [2,7,8] Another theory (Minh's theory) suggests that extra-uterine growth of endometriotic tissue occurs as a result of metaplastic transformation of pluripotent peritoneal mesothelium. [2,8] Other hypotheses suggest migration of cells through the lymphatics or bloodstream, development of - endometrial nodules by metaplasia of Müllerian remnants, iatrogenic implantation, infiltration along the nerves, or direct infiltration along structures such as the round ligament. [2,7-9] In all probability, endometriosis is a complicated, multifactorial disease involving a complex interplay of genetic, familial, immunological and other factors. Although the rectosigmoid colon is the commonest site of involvement, any part of the GIT can be affected. [1-9] Bowel endometriosis occurs as an 'invasion phenomenon' from outside - implantation begins on the serosa and sometimes invades the muscularis propria, but the mucosa is rarely affected. [2,5,7] Lesions that do not infiltrate beyond the subserosa remain asymptomatic, symptoms appearing only when the disease infiltrates the muscular layer. [6,7] The symptoms and signs of bowel endometriosis vary depending on the site and extent of involvement,[1-6] although the mechanism by which bowel endometriosis causes intestinal symptoms remains unclear - large lesions may cause fibrosis and thickening of the bowel wall, resulting in stricturing and mechanical bowel obstruction, or they may infiltrate and damage the intestinal nervous plexus or the interstitial Cajal cells, or cause attrition of the intestinal sympathetic nerve fibres. It can be very difficult to distinguish GIT endometriosis from other GIT pathology, since there are no pathognomic symptoms of the disease. Patients may sometimes be asymptomatic, but the majority present with nausea, constipation, diarrhoea, bloating, tenesmus, painful defaecation, lower abdominal or pelvic pain, bowel perforation or rectal bleeding. These symptoms are usually cyclical, occurring at the time of menstruation. [1-9] Endometriosis of the appendix can mimic acute appendicitis, and obstruction of the small or large bowel can occur when they are involved and needs to be differentiated from carcinoma, especially in the large intestine. Rarely, malignant change can occur in endometriotic foci.